It’s really all about collagen (and ceramides, too)! 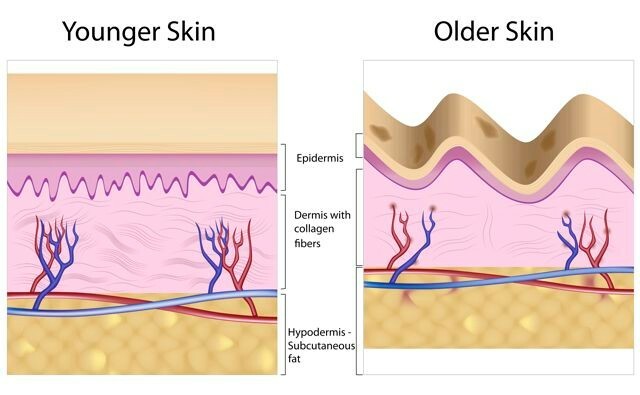 A contributing factor to wrinkles, sagging and thinning of skin is the natural loss of collagen (and ceramides), and unfortunately this speeds up more dramatically as we age. Replenishing or stepping up production of collagen (and ceramides) is the key to “Aging Vibrantly”. 1) Collagen makes up more than 70 percent of our skin and is responsible for “holding it together” for that youthful, firm and supple look. 2) Collagen is the most abundant body protein we have, and makes up about 1/3rd of our body weight. 3) Ceramides make up 40% of our skin, and are responsible for moisture, plumpness of skin, protecting it and acting as a barrier against the environment. 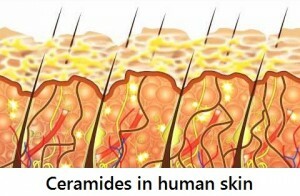 Ceramides help protect collagen. 4) As aging occurs, and the skin is less able to generate collagen and ceramides, and we then see wrinkles, fine lines, sagging and thinning due to these losses. It is estimated that by age 40, the body has lost 15 percent of collagen production and by age 60, it has lost 45 percent. 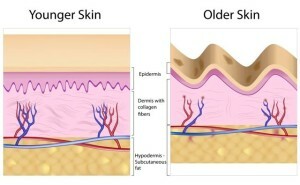 As seen in the chart above, younger skin contains more collagen that keeps skin smooth and strong, but as collagen production lessens, a less smooth – wrinkled – skin occurs. Skin care includes protection and boosting production of collagen and ceramides to AGE VIBRANTLY AND WELL! Protection means using sunscreen and shade, eating and drinking well, and keeping skin as healthy as possible. This includes exfoliation, anti-oxidant masks and great products that boost collagen production. Boosting collagen comes with products that have specific ingredients (such as Matrixyl, an important peptide and Human Fibroblast Conditioned Media, stem cells that step up collagen production) and other ingredients mentioned below. Boosting ceramides comes from taking a daily Phytoceramide capsule. 1) Our Collagen Peptide Serum! Matrixyl is the star peptide in our great serum made especially to help boost collagen as well as moisturize and heal. Our Collagen serum also contains aloe, hyaluronic acid (see below), collagen, elastin and ginseng among other ingredients – all to support and boost collagen. 2) Our new scientific Cell Renewal |Fibroblast Serum! Human Fibroblast Conditioned Media is the main ingredient, 97% to 100% pure. Fibroblasts are in our skin and tell the skin to product collagen, and they are potent stem cells rich in growth factors and proteins to reverse the aging of skin. The stem cells are NOT embryonic stem cells. 3) Face Whisperer Night cream and the new Face Whisperer Advanced Eye Gel also contain Matrixyl. Matrixyl is key in collagen-boosting. A recent study published in Molecular Pharamaceuticals highlighted that Matrixyl can boost collagen by 50%!!!!! 4) Ageless Serum and Ageless Line Smoother both contain Matrixyl, and are the newest products at Sublime Beauty. The clinical tests on Matrixyl are clear – this peptide works, and this is why we have added new products with Matrixyl! 5) Retinol. Retinol encourages cell turnover to reveal younger, new skin and collagen production. Retin-A is difficult to tolerate for many. We developed a great Retinol Serum at 1% that is non-irritating but very effective. Our serum also contains Vitamin C, also important for collagen and skin. 6) Vitamin C. Vitamin C is critical for skin texture and health and as a key anti-oxidant. We include Vitamin C (at 5%) in our Retinol Serum and in our new Vitamin C Collection (toner, serum and SPF 30 day cream)! 7) Hyaluronic Acid. Hyaluronic Acid words in tandem with Collagen and is responsible for plumping and holding moisture in. Our new Hyaluronic Serum adds back moisture. This essential ingredient is also found in our Collagen Serum, Cellulite Lotion (for supporting and smoothing skin) and Face Whisperer Neck & Decollete. Hyaluronic Acid occurs naturally in the dermis and plays a key roll in healthy skin, regulating water-absorption. Other peptides are found in many of our products as well. Our new website at Sublime-Phytoceramides, explains it all, includes guides and brochures, and DISCOUNTS!